GlobeCore is delighted to inform of yet another expansion of products. From today representatives of road works companies can purchase RBE-0,2 bitumen sprayers. 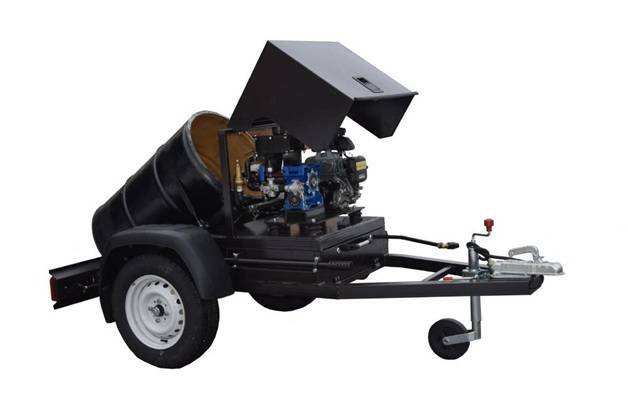 This bitumen spraying equipment is designed for covering surface with bitumen emulsion by spraying it during asphalt repairs and maintenance of sections of small road and other objects of road facilities. In particular RBE 0,2 is indispensable at construction and repairs of parking zones, pedestrian and cycle lanes. Visual control of emulsion level is possible through the filling opening. Current emulsion temperature is checked prior to loading by a visual thermometer. If work requires other temperature – material shall be previously heated or cooled. Filling the sprayer with emulsion is carried out through the filling opening. Sprayer RBE-0,2 has compact sizes allowing it to be used at small construction sites and house yard territories. Hand operated bitumen spraying equipment allows treatment of hard-to-reach places. Main advantages of the new equipment – its mobility and autonomy (owing to diesel engine), that is why it can be used at repairs of yard areas.